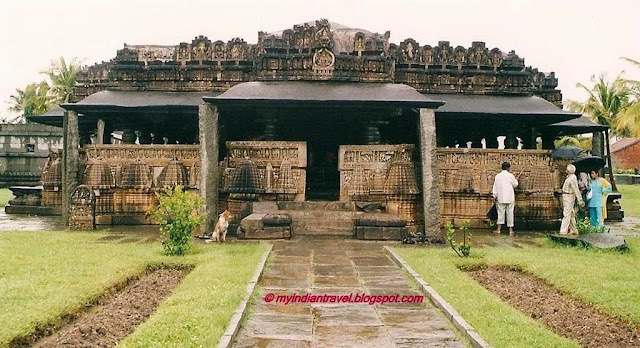 Bhadravati is a small town in the state of Karnataka just 20 kms from Shimoga. The place has got this name as the Bhadra River flows through the city. This city established itself as industrial town as various industries were setup here in the early days: iron mill in 1918 and a paper mill in 1936. In the ancient times Hoysala Dynasty ruled this place and the sacred temples built in those days are still present in the city. One such ancient temple is Lakshmi Narasimha Temple. Other places of interest nearby is Shimoga which has several tourist attractions. Another village near this city is Amratpura and here there is beautiful Amruteshwar Temple. Would love to visit Amruteshwar temple. Nice post. My favorite photo of the series is the last image with the dog and the people. Gives the photograph a story. Nice landscapes, and the temple is so attractive. Lovely, peaceful skies and a beautiful place to spend some time! Wonderful captures as always, Rajesh!! The river and the sky are beautiful. I am continually amazed how rich and ancient India is. I learn something every post. Exquisite pictures, I love this exquisite place !! Gorgeous shots. Great reflection. Have a lovely weekend. Thanks for sharing a beautiful place that I would probably never see otherwise. The temple looks inviting. I'm in awe that this kind of history and beauty is a part of your daily life. How rich! Thanks for sharing. Beautiful place.